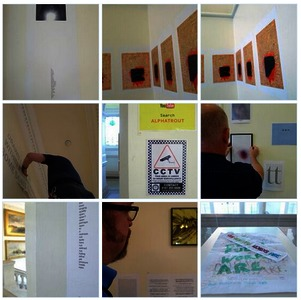 Two works commissioned for TEXTfestschrift at the Bury Art Museum, Lancashire. 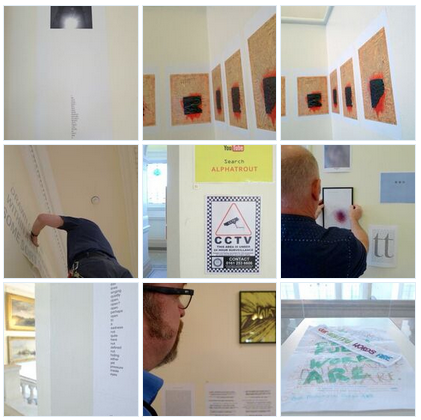 The exhibition was themed around ‘the notion of constructing memory, using the material of language’. Of the two pieces – one deals with the translation of an experience into a ‘recording’ of the event that we keep in our heads and can no longer compare to the original – our memory relies on information being encoded, stored and retrieved, but that process in itself creates a version of the event that is altered in the manner by which it is processed. The on/off firing of our synapses, being as unlike the original experience itself, as a half-tone print is to the original photograph. Similarly, the memory itself can be altered during the ‘recalling and retelling’ of a story. It can be amended, degraded, embellished in all manner of ways, consciously and subconsciously until it becomes something quite different. In the same way that the elements of letterforms might be able to be deconstructed and reconstructed in various ways to create new words. The second piece is inspired by a quote from Allyson Strafella – ‘Memory changes the story of an experience’. Here the text is taken from an essay on memory and slowly altered until it becomes something quite new – a transition from the original story to a new re-telling of an experience which in turn will create a new memory.